What is your most hated criticism against your most wanted character? I got the idea for this thread from here and GameFAQ, listening to reason as to why people don't want certain characters in Smash for the littlest of reasons. Sure there are some good and legitimate reason for why a character shouldn't be in Smash (Goku being a 4th party character/ Sora being a licensing nightmare), but some haters just bring in the most pettiest of reasons for why they shouldn't be in smash, and you get tired of that complain cause really it doesn't add anything against that character. For example, People don't want Bandana Dee in Smash cuase they feel "it would be like putting a Goomba in Smash" or how people don't like the thought of Indie characters being playable in Smash. Andy not being a fighter because he hasn't been shown fighting before. For Mimikyu, it was extremely underestimated and put down as the "Pikachu knock off" when that's what its supposed to be. Also, some speculators even attempted to make it literally that, completely ruining its concept. For Bomberman, it’s the assumption that having bombs as part of his move set, even though that’s in character, is somehow “uninteresting”. That certainly didn’t stop Little Mac from being on the roster. - ...yeah. THAT argument, I'm sure you can guess which one it is. For Lloyd, I feel like some people don't want him in because he'll just be "another animu swordsman" and some feel like Heihachi would be the better second Namco rep.
Sora's the one I can think of with an argument I dislike against him. "He'll open the floodgates to cartoon/anime characters" which I think is silly, like somehow Sakurai will just decide "WELP! TIME TO SHOVE EVERYTHING ELSE IN NOW!". Honestly Sora is first and foremost a video game character, the main character of his franchise, and while it does contain Disney characters, he's at the point where he could hold his own without Disney characters and stuff, too. Honestly I just don't like "They'll open the floodgates" arguments, like the casts of Smash games aren't pretty curated bunches. Some other arguments I see are just blind hate because Kingdom Hearts I suppose. For my most wanted character, Shantae, I don't really have an argument I hate, 'cause I can usually just be like "I could see that but still I don't think that" so I'm just having to pick one of my top 4. "Not another generic sword character !!!!!!!!!1!11! " I geuss the worst argument for any character like Issac would be the irrelevance argument. Which is now an a irrelant argument. Disney owns Sora so he would never join even if Disney has said they would likely say yes if asked. Sora: "He'll lead us down a slippery slope"
Bandana Dee: "Gommba with a hat." Wonder Red: "He comes from the Wii U, and Nintendo doesn't want us to remember that." One is not being "popular" enough when #1: he actually is decently popular and #2: doesn't matter when the final roster was more likely than not decided before most of the gen 7 mons were even revealed to the public. Second is him not able to be as "unique" as Mr. "might as well be another fire fighting type". Because apparently he has absolutely nothing to offer to the roster because of Pit/Dark Pit's LITERALLY ONLY ONE MOVE. According to that logic Incineroar wouldn't be unique either because Bowser, K. Rool, Kirby, Jiggs, Snake, etc. all each have at least one wrestling-esque move. Also him being an archer isn't even the main reason why I think he'd be a fresh, unique addition, it's the fact that he's a ghost. Ganondorf's already in the game so we don't need Ganon. My main issue with this criticism is that Ganondorf doesn't even fight like Ganondorf in the first place, so Ganon being put in wouldn't take anything away from the character already in Smash or pad out the roster like the various Links or Marth-based Fire Emblem Lords do. Ganon's also a polearm wielder on top of being magically proficient, so his exclusion over his identity is even more of a waste. Plus they look nothing alike, Sakurai would have to go out of his way to somehow make him a clone/echo rather than an original fighter. This is demonstrably wrong in so many ways that there's a section dedicated entirely to Yuri vs Lloyd in the Lloyd Support Thread. We've got polls, developer interviews, ballot results, and Sakurai himself flat-out saying that Lloyd is unquestionably the definitive Tales pick a full year after the Smash Ultimate project plan was finished. Tales is the biggest traditional JRPG franchise after Final Fantasy and Dragon Quest. Bigger than Persona, bigger than Yakuza, bigger than Paper Mario, bigger than Kingdom Hearts. It's bigger than Ni no kuni, Disgaea, Chrono, Yo-Kai Watch, Golden Sun, Bravely Default, Atelier, Xeno, Suikoden, and Etrian Odyssey combined, and then some. It has spawned two dozen mangas, several animes, some movies, drama CDs, an annual festival hosted in stadiums that over 20k people attend, and was considered for a ride at Universal Studios Japan alongside franchises like Final Fantasy, Sailor Moon, and Detective Conan. This series has sold over 25 million mothership titles, and that's not counting the insane number of auxiliary content (animes, mangas, movies, arcade machines, the festival, and an absurd amount of merchandise). Lloyd himself has appeared in more than ten games, and his original games are more than just mildly popular, given that ToS and ToS 2 alone moved almost 5 million units. "Heihachi would be Namco's second rep."
Honestly the only argument that harbors any potency, and even then you ought to consider that we've now got at least one confirmed instance of triple third party reps, the fact that Tales has significantly more pull with the casual audience than Heihachi does, and the fact that Lloyd would be far easier to implement, as 90% of his moveset is already in the game. "He'd be yet another anime sword fighter." First things first: sword fighters are far from over represented. Secondly, the arte system and his ToS build would render Lloyd not only fairly distinct from other sword fighters, but it would also make him a very unique character in the roster at large. Bandana Dee: "It'd be like having a Goomba in Smash." These people have clearly never played a Kirby game with Bandana Dee. My biggest objection to BWD/Waddle Dee is that he looks like a literal duckhead. "He's irrelevant, he hasn't been in a game in ten years!" "No one knows who he is! Even in the DKC games you never see him until the end!" "The Mii costume is all you're going to get!" "He'd just be a Bowser clone!" "DK is just part of the Mario series, it doesn't need more reps!" "I want characters from the 21st century in my Smash games!" "K. Rool didn't do well on the Ballot, the silent majority voted for Bayo!" This logic has always baffled me. IMO, Ganon is one of the most glaring omissions from the Smash roster, and having only Ganondorf in his place is, to me, like having Sheik but not Zelda. Haven't heard any really infuriating criticism about Dark Matter recently, most of it's just "I'd prefer insertotherKirbycharacterhere" so I'll talk about Bandana Dee instead. The Hat Goomba argument is annoying, like yes, he is the same species as a generic enemy and his design is the same as them except he wears a Bandana, but he's also a deefined character with his own personality, it doesn't disqualify him from being his own character. It'd be like if someone said Skull Kid shouldn't be in Smash because he is just a Mask Goomba. For Sora, this one because all of a sudden people become legal scholars. It sounds reasonable at first, but it's just fan assumptions. Don't know what it's actually like inside these companies, don't know a thing about law, but assert it nonetheless. On Goku, I don't care, but forth parties is just a made up term. Just say that's where Sakurai draws the line in the sand without the weird term. Honestly - any character rights concerns are pretty often overstated by the community. Just because a character belongs to company X doesn't mean they are more difficult than character Y (ala Sega, Capcom, etc.). Licensing can be overcome with a proper relationship and anyone who's really saying, "Oh Sora would be too tough because he's Disney" or "Banjo & Kazooie would be too hard since they are microsoft". Really? Why? Disney/Marvel/Star Wars characters appear in every game under the sun these days and so many other companies (way less influential than Nintendo) manage to snag these rights easy. Everyone seems to turn into armchair IP lawyers whenever it's convenient. Endless Ocean is a dead franchise with no support, thus it can’t have a rep. Endless Ocean has characters that can’t fight or wouldn’t work. I would assume those would be the criticisms towards Endless Ocean if anyone actually cared about it to begin with. Trust me if your series gets more than one rep per entry, people will definitely scream that Sakurai has bias towards it, not that I'll name any series in particular that gets such hate hahaha. "Chrom is just another anime swordfighter"
"FE has too many reps"
Overall more hate for Chrom, but who's laughing now? "He was only made to be Wario's partner!" Wii Fit was only made because fat people needed some damn exercise, your point is? "He doesn't have moveset potential!" First of all, play the spin-offs. Captain Falcon obviously won't be in because he doesn't have moveset potential, stop asking for him, it's not going to happen. Funny, because if it’s a franchise like Pokémon, Donkey Kong, or Metroid, then suddenly it’s completely okay to have two characters join per entry. Also Bayonetta ain’t that bad, she was deserving of her spot. The only bad thing is how op she is, otherwise the character is completely fine in my opinion. I’ll admit that I’ve grown a liking to her in the same way I did for Snake to the point that I feel her being left out will leave a gap in the Smash roster just like Wii U had with Snake’s absence. I wish people knew enough about my character to have criticism of him. is a valid criticism in and of itself. Now Chrom is in, and he seems to be more distinct from his base than Lucina or other echo fighters. It's kind of funny how that worked out. 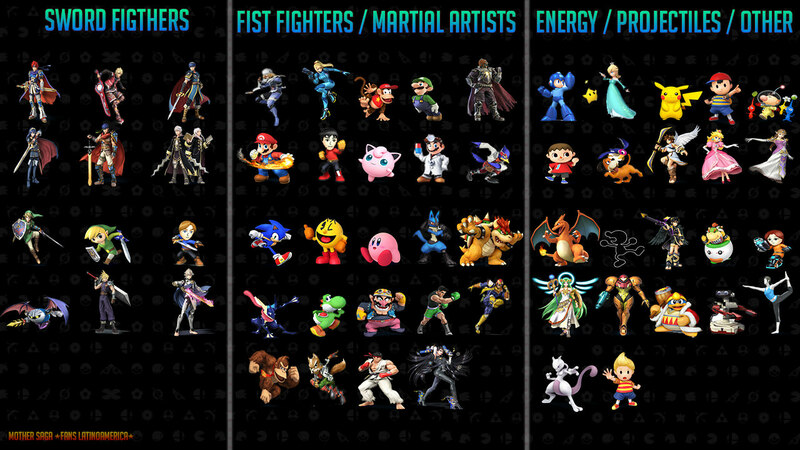 This is a hilarious one because the entirety of the Fire Emblem roster are mostly one-offs. Being a one-off doesn't mean they shouldn't be in Smash. Popularity among communities should imo. 1) "WarioWare doesn't need any more reps. It's not big enough"
By that logic, Xenoblade doesn't need a second rep, either. It's a newer series comprised of three games, only one of which (XB2) actually managed to cross the "million-plus sales" threshold. WarioWare, as a series, has been around since the GBA/GameCube, and has had eight installments, three of which (Mega Microgames, Touched, Smooth Moves) have sold over a million copies (with its newest installment, WarioWare Gold, well on its way to be the fourth). 2) "Ashley isn't an important enough character." What constitutes as an important character, exactly? Within the confines of the WarioWare series, every character is about as important as the last (Wario excluded), so it really comes down to popularity. And sure, people might downplay the Mii Costume, cameo in Mario Maker, starring role in the Badge Arcade, three 3DS themes, and use in smaller-scale advertisements for eShop games/ a regional convenience store, as far as reasoning for promotion within Smash goes, but it is far more than any other WarioWare character has gotten. 3) "What could she even do?" About as much as Captain Falcon does in F-Zero, I would presume. No, but seriously. Ashley has been shown shooting stars with her wand, brewing potions, summoning plant monsters, riding brooms, shooting lightning out of her fingers Darth Sidious-style, unleashing an explosion of magic, and her best friend is an imp who can transform into just about anything she wants (including a pretty cool looking magic wand/scepter). If that isn't foundation enough for a moveset, then I'm not entirely sure what is. She's an Animal Crossing character. What character from that series isn't a pacifist? 1) "You only want him because he's a meme." Actually, I've liked Waluigi since I was a child who knew very little about the Internet. I always thought his weird movements and petty personality were hilarious, and that few characters - if any - could effectively capture that same "two parts wacky, one part defeatist" aura that he gives off. Plus, he can swim in midair. That's such a weird concept and I love it. And so what if he's a meme? Obviously, he's such a ridiculous character that his antics resonate with a lot of people. How is that a bad thing? Be grateful we aren't talking about Shrek or Spongebob, haha. 2) "Some people on Twitter harassed Sakurai so I hope Sakurai punishes all Waluigi fans by never putting him in Smash Bros."
Before you pre-maturely bring down the hammer of justice on a large group of people, let's remember that that was only some people. SOME. I'm sure there were a few bad eggs in the Ridley, King K. Rool, Geno, etc. fandoms who said a nasty thing or two about Sakurai throughout the years. Are you willing to apply your personal sense of video game justice to those fans, as well, or is it just easier to feel that way about Waluigi because the timing is convenient? 3) "Waluigi isn't an important character." In a franchise as simple as Mario, all it takes to be considered "important" is to show up, and Waluigi has done that in almost every Mario spin-off game since the N64. He shows up in merchandising the world over and obviously has his fans, so...you're wrong. It'd be like if someone said Skull Kid shouldn't be in Smash because he is just a Mask Goomba. I understand where you're coming from but that's not a good analogy at all. Skull kids as a species only appear in 3 zelda games. The one in Majora's Mask is the main antagonist, the one in Twilight Princess is a miniboss, and the ones in Ocarina of Time aren't enemies at all.